I love reading about food. I am not just talking about cookbooks, though I can read those in bed too. I am always searching out works that feature food in some way, no matter how subtly. I treasure snippets about food and cooking in novels, and nonfiction books about food in general or a particular ingredient. And as long time readers of this site may know, the inspiration for starting Just Hungry came from a quote from one of M.F.K. Fisher's books (more about that here), arguably the greatest food writer of the 20th Century. Imagine my joy to discover that there's a new journal dedicated to "The Literature of Food". 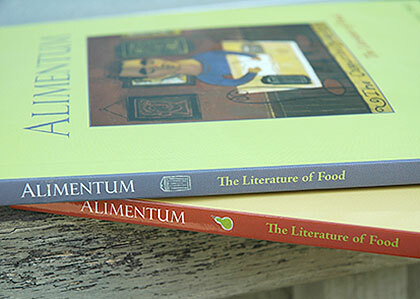 That is Alimentum, a bi-annual publication that premiered this winter. I may not have found out about it unless Paulette Licitra, the publisher, had not read my write up of the 92nd Street Y roundtable about Gourmet magazine's Food Writing supplement, and offered to send me a review copy. She kindly sent both issues, the inaugural Winter 2006 issue and the recently published Summer issue, both of which I devoured over the weekend. Because I love literature and I love food, when I read about food I want more than a recipe list, more than a restaurant critique, more than a description of exotic cuisines sampled in faraway places. I know that food has a personal presence in our lives -- it's not just a matter of taste and culture. Food also simmers in our hearts--like music, nature, and dreams. Alimentum is $10 ($14 outside of the U.S.) per issue, or $18 ($24) for a one-year (two-issue) subscription, available from their web site I'm eagerly looking forward to their next issue already. Submitted by maki on 2006-07-31 14:14. The biggest reason why I love Laura Ingalls Wilder's Little House on the Prairie series is because of the food. Usually it's how they survived on the prairie but Farmer Boy, the story of her husband's childhood and they were more affluent farmers, described so much delicious food. I even got the LHotP cookbook and attempted some settler recipes. I loved it! I loved the Little House series too, especially the first one (Little House in the Big Woods). To this day I've never made maple sugar candy in snow...something I hope I get to do one day. Another series mainly aimed at children (or young girls anyway) with a lot of delicious food, and I think an accompanying cookbook, is the Anne of Green Gables series. There are a lot of food or drink centered stories - who can forget Anne getting Diana drunk by mistake on what she thought was black current cordial, but turned out to be homemade wine? I still pull out those books and re-read them occasionally. Other books by the same author, Lucy Maud Montgomery, have lots of food in them too - the Emily series, Jane of Lantern Hill (in which a shy, unconfident girl gains self-confidence as she learns how to cook among other things) . Thanks for triggering my memories!